Kalahandi: The Odisha government today signed a Memorandum of Understanding (MoU) with Vedanta Group, a globally diversified natural resources company, to set up a 500-bedded medical college and hospital in Bhawanipatna in the district. 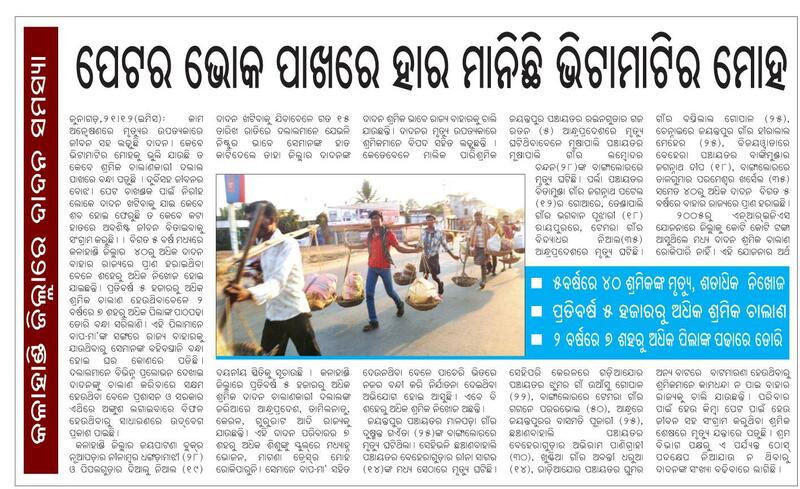 The tribal-dominated district had hit the headlines of national and international media and caused embarassement to the State government for its poor healthcare facilities after the Dana Majhi episode in August, 2016. The MoU was signed in presence of Chief Minister Naveen Patnaik and State Health and Family Welfare Minister Pratap Jena. Sonamali Bag, Director of Medical Education & Training (DMET) of the State government and Rahul Sharma, Director of Corporate Strategy at Vedanta, signed the agreement. As per the agreement, total Rs 350 crore will be invested for setting up the proposed medical college, of which Vedanta will spend around Rs 100 crore. While the State government will run the medical college and hospital, Vedanta will develop infrastructure support for it. Official sources said as many as 100 MBBS seats will be available in the medical college. The Chief Minister has directed the Family and Welfare Department to start the construction work of the proposed medical college soon and complete as early as possible. Chief Secretary AP Padhi, Development Commissioner R Balkrishnan, MLAs of Kalahandi district among other officials were present. Notably, in April last year, the CM had announced to set up new medical colleges at Koraput, Mayurbhanj, Puri, Bolangir, Balasore, Kalahandi and Keonjhar to tide over the shortage of doctors in the State. Patnaik had laid the foundation stone of the medical college at Bhangabari in Bhawanipatna, the district headquarters town of Kalahandi, in November 2016. What can be done for Odisha’s abject poverty? What can be done for Odisha’s abject poverty? Please click here to download the E-book. The State Government has requested the Centre to accord approval to nine polytechnics to start functioning from 2014-15 academic year as the buildings have already been completed. In a letter, Chief Secretary Jugal Kishore Mohapatra has requested Ashok Thakur, Secretary in the Department of Higher Education of Ministry of Human Resources Development (MHRD) to advise the All India Council of Technical Education (AICTE) to accord approval to the polytechnics at the earliest. The polytechnics are located at Jajpur, Kalahandi, Nuapada, Puri, Angul, Bargarh, Boudh, Koraput and Nayagarh. The Chief Secretary said the new buildings have been inspected by the expert team of AICTE. Steps have been taken to correct the deficiencies highlighted by the team. As pointed out by the team, library books along with required journals and personal computers will be available by July, 2014, he said. Mohapatra said applications have been received for recruitment of laboratory assistants and lecturers by the Odisha Staff Selection Commission (OSSC) and the Odisha Public Service Commission (OPSC) respectively. The recruitment process for these posts is expected to be completed before the start of the 2014-15 academic session, he added. The MHRD had proposed to set up 22 Government polytechnics in the under-served and uncovered districts of the State under the scheme of ‘Submission on Polytechnic’. The State Government has made a provision of `12.30 crore for each polytechnic to be set up. In August, 2013, the AICTE had given its nod to eight polytechnics to commence classes in the 2013-14 academic year. BHUBANESWAR: The Centre has given its nod for establishment of three medical colleges in the state during the 12th five year plan, health secretary Pradipta Mohapatra said here on Thursday. The Centre would provide 75% funds for these colleges with the rest coming from the state coffers, he said, adding, the colleges will have 100 MBBS seats each. Mohapatra said the new colleges would come up at Balasore, Koraput and Balangir at an initial investment of Rs 189 crore each. District headquarters hospitals in these places will be attached to these medical colleges, land for which will be provided by the state government within 10 km of the hospitals. These proposed medical colleges are part of a central scheme, under which 58 colleges would be established across the country by 2017. Construction of these colleges would start soon after signing of MoUs with the Centre, he said. Odisha had requested the Centre to grant four such colleges, including one at Baripada, a statement issued by the chief minister’s office said. CM Naveen Patnaik has expressed his anguish over the central government not considering the state proposal for medical college at Baripada. “Considering that Mayurbhanj district is tribal dominated, the Centre should also consider the demand of converting Mayurbhanj district headquarters hospital at Baripada into a medical college along with the three others,” the CM was quoted as saying. 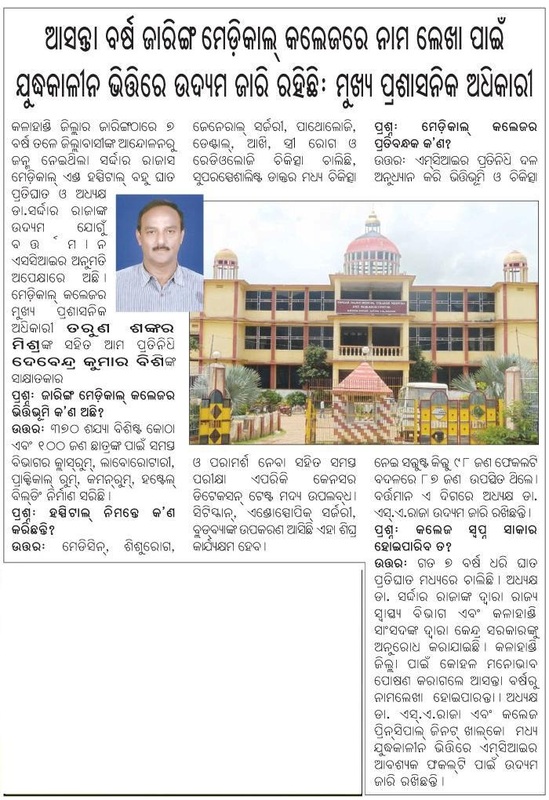 Odisha currently has nine medical colleges.